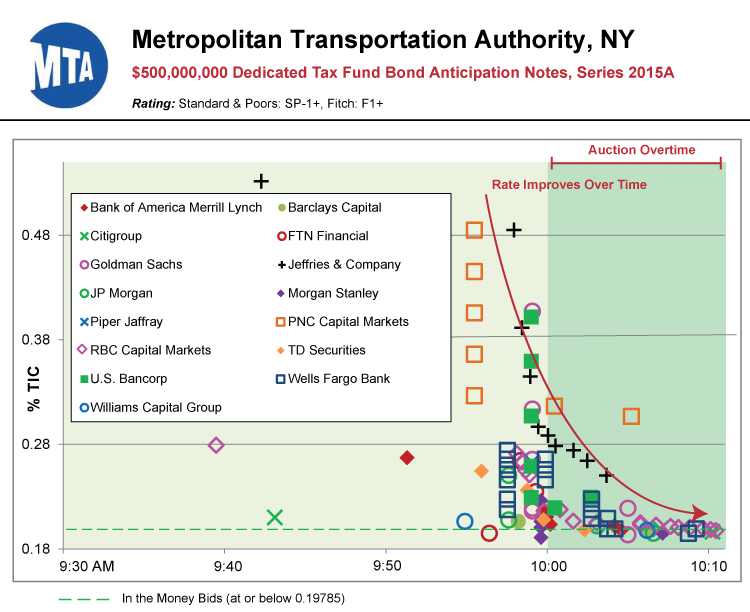 On Wednesday, September 9, 2015, the New York Metropolitan Transportation Authority (MTA) competitively sold their $500 million Series 2015A Dedicated Tax Fund Bond Anticipation Notes on Grant Street Group’s MuniAuction® platform. During the open auction, 15 underwriters submitted a total of 106 bids, and triggered the Two-Minute Rule 20 times. MTA allowed underwriters to submit partial bids. At the close of the auction, eight firms were “In the Money”: Morgan Stanley, Goldman Sachs, FTN, JP Morgan, Wells Fargo, Citigroup, RBC, and Bank of America. If you would like to learn more about MuniAuction, or see a replay of the MTA open auction, please contact John McCarthy at 412-391-5555, ext. 1321 or John.McCarthy@GrantStreet.com.